Which format is best for your DAC? Every DAC has it's own character, some sounds better using PCM files and some sounds better using DSD files...... Some people find the convenience of FLAC files more important. Here on this page is a list containing 2 minutes of a song in 11 different formats. 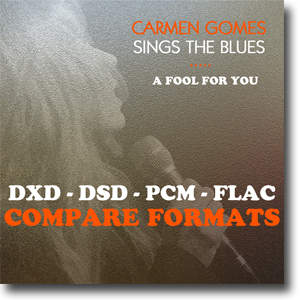 The song is called 'A Fool For You' and is performed by Carmen Gomes Inc.
It’s taken from the album 'Carmen Sings The Blues'. All the different formats have the same source file, DXD 352kHz (Studio Master). We used the AUL ConverteR 48x44 for the conversion to DSD and Wavelab for the conversion to the other PCM formats and FLAC. When you compare different sample rates always start with the lowest resolution. During listening don't focus too much, hearing is as individual as taste but hearing is also something which can be acquired, like the taste of good wine.